Pampering our clients for over 30 years! 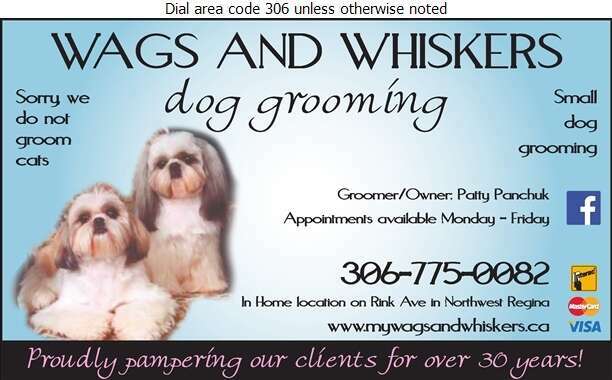 Wags and Whiskers, offers the very best in dog grooming and has been serving Regina City and area since 1980. We offer a variety of grooming services for dogs of all sizes. Patty prides herself on providing impeccable one on one pampering for your dog & completes every grooming service herself. As well as grooming Wags and Whiskers offers brushing, ear cleaning, nail clipping and coat styling. We use a gentle shampoo to promote a healthy coat. Depending on your needs you can choose from a grooming package or customize your dog's experience from a list of individual services. We are open Mon to Fri and offer evening appointments for your convenience. Grooming is a vital part of maintaining your dog's health and physical appearance. Call Patty today to set up your next appointment.